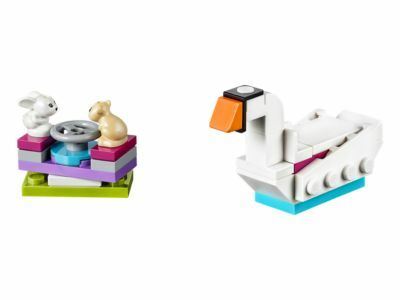 Add to any LEGO® Friends collection with this handy set of buildable Heartlake City accessories. You can build a stage for LEGO Friends performances, skateboard for the girls to practice their tricks, table tennis table, juice-making station and more! There’s even a couple of cute and tiny animal friends to look after. Last known price is 50% below the initial Lego retail price! The LEGO® Friends Build My Heartlake City Accessory Set (40264) Lego set is no longer directly available from the sites below. However, 3rd party partners of these sites might still have the set available. Alternate description Enjoy a bundle of extra LEGO® Friends fun! Features several small, buildable models including a stage, table tennis table, skateboard, barbecue, juice-making station, swan, bench and an animal roundabout. Includes 3 small animal figures. Accessory elements include a microphone, sauce bottle, sausage, pineapple, glass, carrot, cherries and 2 tennis rackets. An ideal accompaniment to the 853671 LEGO® Friends Heartlake City Playmat.